California State University, Northridge chemistry professor Maosheng Miao and his graduate students are harnessing the power of high-speed, highly efficient computer software to explore new frontiers in chemistry. Photo by David J. Hawkins. There’s not a beaker or Bunsen burner to be found in California State University, Northridge chemistry professor Maosheng Miao’s lab — he and his graduate students harness the power of high-speed, highly efficient computer software to explore a new frontier of a very old scientific discipline: the study of atoms and how they bond and change under high pressure. This small but passionate research team is exploring some big questions: How will basic chemical elements change and form new compounds under extreme pressure? Will they develop superlative properties, such as extremely powerful magnetism or intense energy? For his endeavor, this spring Miao earned a $490,000, five-year grant from the National Science Foundation (NSF). Dubbed a CAREER Grant, the award targets young professors who show promising research potential, place an emphasis on teaching, and include undergraduate and graduate students in their hands-on research. Miao is only the third CSUN faculty member to earn this grant since 2013, said Crist Khachikian, associate vice president of research and graduate studies — geological sciences professor Joshua Schwartz and biology professor Cheryl Van Buskirk also earned the NSF grants. Geological sciences professor Dayanthie Weeraratne also was a recipient in past years. 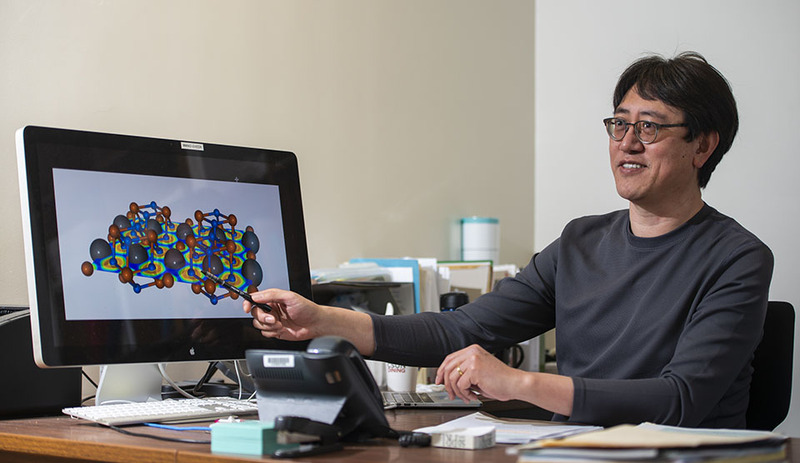 Miao is a computational chemist, which means he uses computer simulations based on quantum mechanics to study the crystal structures, stability, magnetic properties and other aspects of chemical compounds. In 2011, he started studying high-pressure chemistry, focusing on how atoms and chemical compounds change under extreme pressure. “With computational chemistry, you have the power of exploration,” he said. “It’s easier to quickly move around. If you do experiments [in a traditional lab], if you come up with a new idea, you have to reset your lab. Very often, you just give up. But even if you don’t, it takes months or even years to reach a point where you can check whether your idea works or not. As an example, he cited one compound he studied and wrote about in a scientific journal article in 2013, later profiled in Scientific American: CsF, Cesium Fluoride. Miao has taught at CSUN since 2015. He teaches general and physical chemistry at the undergraduate and graduate levels. To study and calculate chemical properties and electronic structures of materials, the professor and his students use computer programs that sound like they’re straight out of a Marvel superhero movie: VASP (Vienna Ab initio Simulation Package) and PSO (Particle Swarm Optimization), a computational method whose algorithms mimic a swarm of birds to move toward the best solution. Another piece of the NSF grant project will focus on earth science, studying changes in elements such as iron that are widely found in the Earth’s crust, mantle, and inner and outer core. “The distribution of elements in the Earth is a very important reference for studying Earth’s history,” Miao said. Miao called chemistry “fascinating,” especially working in theory. Research assistant and CSUN graduate student Dalar Khodagholian was thrilled to discover the combination of chemistry and computers. “I didn’t know this was a field,” said Khodagholian, who completed her bachelor’s degree in chemistry at CSUN in 2018. “I was looking for a research project, and I went to listen to a talk on campus by Dr. Miao last year. I was very excited, so I took advantage of the opportunity.